Unless you’ve been on a very long vacation on a remote island, you’ve probably heard some of the talk about how telemedicine is transforming the healthcare landscape. Video visits are becoming ever more popular as an alternative to in-office visits for both primary and specialty care. 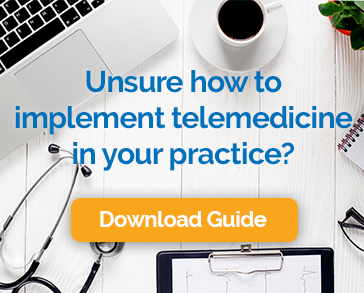 But how do you know if it is time to implement a telemedicine program for your practice? Here are five signs that it is time. For many patients (i.e., customers), especially younger ones, the availability of video visits is a deciding factor when choosing a provider. They love the convenience of connecting from their home or office without the wasted time and expense of travel. They also appreciate that they don’t have to use their treasured paid time off or risk exposure to another patient’s illness. Keep in mind that your patients have a choice. You are now competing with Internet-only providers, retail walk-in clinics, and other practices with telemedicine programs in place. When you hear your patients ask for video visits, it is time to act quickly before you lose them. No one likes hanging out in a waiting room and long wait times are a common reason for patients to change practices. Telemedicine can help by reducing the time it takes to see patients with minor concerns and allowing scheduling flexibility for maximum efficiency. You’ll probably still get behind from time to time, but at least patients who are waiting for a video visit will be doing it from their home or office where they can continue to be comfortable and productive. No-shows and last-minute cancellations are bad news for the profitability of practices. Aside from good reminder protocols and fees for missed visits, there’s not much you can do about this unfortunate fact of life. Patients are less likely to cancel or flake on their appointment when they can do it from wherever they happen to be and don’t have to worry about many of the barriers to getting to the office like transportation or child care. Telehealth is ideal for meeting the needs of patients with chronic conditions. Having a long-term illness is difficult enough without having to spend countless hours at the doctor’s office. With telehealth important care like medication management and lifestyle, coaching can be done remotely, reducing the strain on the patient and your practice as well. In addition, the Medicare Chronic Care Management program pays providers roughly $42 per month for each Medicare patient with multiple chronic conditions for whom they provide ongoing care. Telemedicine meets the conditions required for this potentially very lucrative reimbursement. Many providers work long hours, miss out on opportunities to enjoy special moments with family, and forgo vacations all to keep up with the demands of a busy practice. Telemedicine allows for increased flexibility regarding when and where you work. Some providers find that doing video visits from home one or two mornings a week, for example, helps them feel like they’ve achieved a better work/life balance. We have customers who take Friday afternoons off and see a few patients remotely on Saturdays instead. This flexibility opens up additional revenue opportunities as well, due to the ability to see patients during the evening or on weekends without office staff or overhead. There are lots of aspects of patient care that it makes sense to do on the phone rather than in the office. Medication checks, reviewing lab results, post-procedure follow-ups and more are all effectively addressed without an in-person visit. However, most payers don’t provide reimbursement for telephone-only consultations. This isn’t the case with telemedicine. Adding a video component to these encounters will make them reimbursable in many cases. Keep in mind that more and more insurers recognize the cost-effectiveness of telemedicine-based care and reimburse for it as if it were an in-person encounter. Also, more than 30 states have current or pending laws that require payers to do so. If any of these situations ring true for you, it is time to think about how telemedicine might benefit your practice. It is probably easier and less expensive to get started than you think, and the best technology services provide plenty of support and make it easy for you to roll out your program. Your patients and your bottom-line will thank you.